I found this recipe in our Daily Inter Lake newspaper, where a photo of the tart (2) really set my mouth to watering. The recipe is originally adapted by Susan Selasky from a Martha Stewart recipe (1), and appeared in the Detroit Free Press (2). This tart is similar to a quiche but is not made with milk or eggs. Ms. Selasky’s recipe uses frozen puff pastry for the shell, but I prefer to make my own using the “Rough” method. This recipe calls for either Fontina or Gruyere cheese; both have similarities to Swiss cheese, with strong, dominant flavors. Fontina is originally from the Italian Alps (but most found in the US come from Denmark and are more mild in flavor); Gruyere is from Switzerland but is very similar to Italian Fontina, and they can be substitutes for each other in most recipes such as this one. If you live in the US and want that stronger “Swiss” flavor go with Gruyere. Commercial frozen puffed pastry come in 10″ x 15″ rectangles, but typically use questionable ingredients; for example, Pepperidge Farm’s pastry is made with soybean oil that is likely GMO, and HFCS which is made using GMO corn and GMO bacteria. My recipes are made using real butter (preferably from the milk/cream of pastured dairy animals), and make 8″ x 13″ rectangles (the Classic recipe makes two rectangles and the Rough recipe makes one). These rectangles are smaller than the 10″ x 15″ needed for this recipe, so you can either make more dough, roll it more thin, or use less asparagus and trim off more from the fat end. Prep: Prepare puff pastry (if not using frozen commercial pastry). See Pastry note, above. If using frozen commercial pastry, remove from freezer and thaw according to instructions on the box. 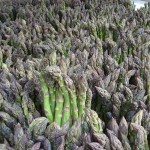 Wash & rinse asparagus; trim bottoms of the spears to fit crosswise inside the tart shell. Tart: When ready to prepare the tart, preheat oven to 400°F. On a floured surface, roll the puff pastry into a 15-inch-by-10-inch (or 13″ x 8″) rectangle. Trim uneven edges. Place pastry on prepped baking sheet. Lightly score pastry dough with a sharp knife, 1 inch in from the edges to mark a rectangle. Using a fork, pierce dough inside the markings at ½-inch intervals. Bake until golden, about 15 minutes. Remove tart shell from oven and sprinkle with the cheese. 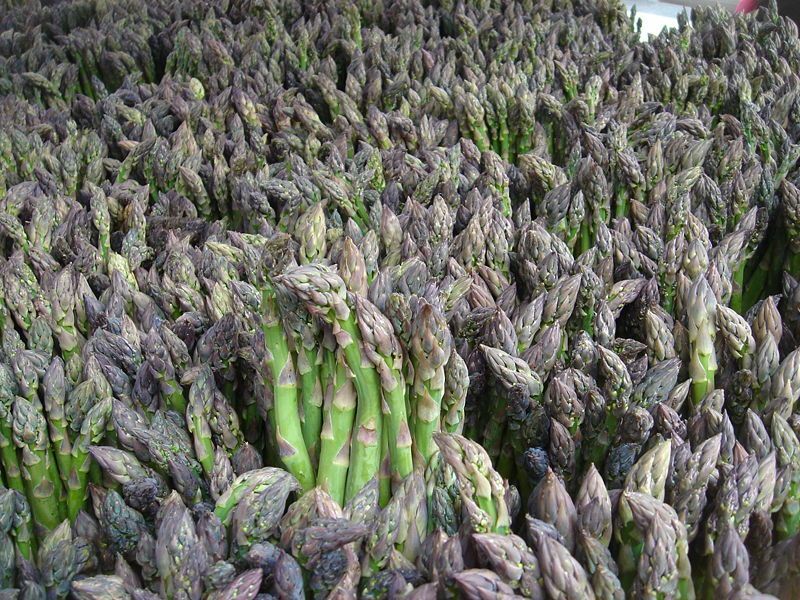 Arrange prepped asparagus spears to fit crosswise inside the tart shell; in a single layer over the cheese, alternating ends and tips. Brush with oil, and season with salt and pepper. This entry was posted in Baked, Dairy, Fat or oil, Leafy Veggie, olive oil, Pastry and tagged asparagus, butter, fontina, gruyere, olive oil, puff pastry. Bookmark the permalink.